SBC CHEVY FRONT ACCESSORIES MASTER KIT. INCLUDES EVERYTHING NEEDED FOR THE FRONT OF THE ENGINE. The pictures below show the front end dress up kit on one of our engines. One more pic from a different angle. Below is pic taken outside on a sunny day. This accessory master kit is exactly what we use on our Turn-Key complete engines. The parts used are of exceptional quality, and fit. We will pre-assemble the power steering bracket to the power steering pump as this an area that we have found to be somewhat difficult for some people. The other parts are very simple and straight forward to assemble. We will also offer technical assistance to those needing it. We have seen other configurations on the market that are nothing more than a mix-match of parts with no regard as to how they will go together. We partially pre-assemble the difficult parts, and should you need help on the installation of the rest, we are here to help. You will also receive the needed hardware for the pulleys and brackets. High quality V-belts are included and are the exact length needed. This setup includes a high volume long style water pump. These water pumps have an aluminum impeller. They are very high quality pumps. Few sellers offer this type of pump. If your vehicle originally had a short water pump on it, and you plan to use an electric fan, then changing over to the long water pump should not be a problem. Most all Chevy vehicles went to the long water pump setup around 1969. Should your vehicle be an earlier model than 1969, this setup should still work without a problem, but if you're running a mechanical fan, be sure you have enough space for your fan blade to clear your radiator fins. The long water pump protrudes forward approx. 3/4 of an inch longer than the short version. GM did not change mounting points on their blocks from the 60's on up, as far as we know. 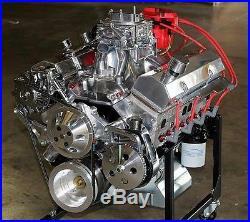 As to how far back in model year that you can go with this setup, we're not sure, but we don't really see any problem using this on engines from the mid-60's on up to the last of the SBC V-8 305 and 350 engines that operated with a V-belt system. Even Gen 1 blocks from the serpentine era can be converted back to the conventional V-belt setup should you desire. Dart blocks are also not a problem for any of these accessories. It is also possible that some of the very early engines from the 50's that had generators on them may not have had the accessory hole for the alternator bracket. This hole can usually be drilled and tapped in the existing head. All of the parts in this kit are offered individually in our ads, and many customers have had difficulty in choosing the correct parts when trying to put together a front accessory setup. Every pulley and bracket must correspond to the accessories used. We have listed all the parts that you will receive in this kit. We will also list what is not included, since the picture we are using has other items on the engine that you will not receive. Please read this ad in its entirety. 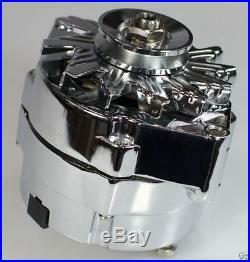 120 amp chrome one or three wire alternator. High volume satin aluminum water pump with aluminum water pump. Chrome power steering pump, A-can style. Polished aluminum PS pump bracket. 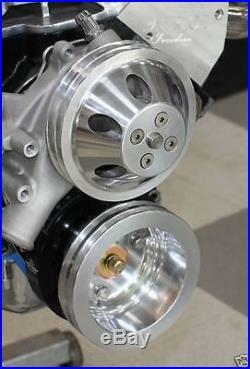 Aluminum pulleys for Crank, water pump, and PS pump. Premium Dayco Top Cog V-belts from Federated. All mounting hardware for the brackets and pulleys. 304 Stainless socket head water pump bolts. 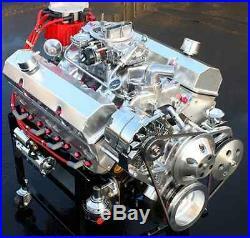 The engine, heads, valve covers, intake manifold, starter, fuel pump or carburetor. Harmonic damper and damper bolt. Water neck or water pipe on water pump. We will assemble the power steering pump to the water pump. The other parts will be individually boxed, and are very simple to assemble. Below is a close up pic of the complete assembly. The many pictures of dress up kit are provided to show you how it looks from many different angles once mounted on the engine. 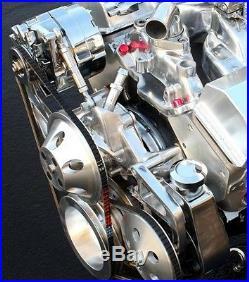 High volume satin aluminum water pump with aluminum impeller. 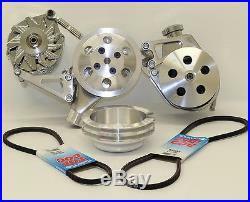 We also offer this kit with a chrome water pump in our other listings. 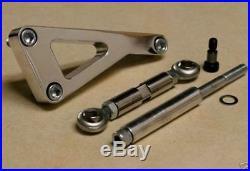 Stainless socket head bolt set with stainless washers. 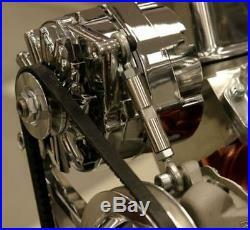 120 AMP ONE WIRE CHROME ALTERNATOR AND POLISHED ALUMINUM BRACKET KIT. WATER PUMP, CRANK, AND POWER STEERING PULLEY. 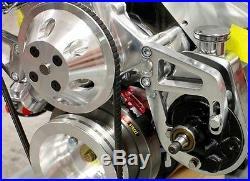 CHROME POWER STEERING PUMP WITH PULLEY AND BRACKET KIT. Many have asked why were able to sell our products for such a great price. Its because were also a major distribution center for all of the parts used in this kit. Few retailers ever get to master-wd pricing. We also believe in keeping our profit levels low enough to allow the working man a chance to build his car the way it should be built. You may have noticed other sellers using a similar name offering similar products. These other sellers have capitalized on our name as we see it, and many customers searching for us will inadvertently find them, thinking we are one in the same company. Our official company name is Skip White Performance. The item must be LABELED CORRECTLY and include a copy of the ORIGINAL RECEIPT inside the package. It is preferable that you use the original package that the product was received in. You MUST label the OUTSIDE of the package with the ATTN to representative that gave authorization written in BIG BOLD LETTERS on the OUTSIDE of the package AND on the receipt inside the package. You must also explain in writing what the problem is with the item. It is preferable that you enclose this information in a packing slip attached to the box. We cannot stress how vitally important this is in regards to getting your return taken care of in a prompt manner. If the item comes back to us UNLABELED and/or NO RECEIPT inside the box, the return WILL NOT BE PROCESSED. If return to sender is not allowed by carrier, the item WILL BE DISCARDED. We are not responsible for collateral damage caused by the use of this product. YOU MAY ALSO REQUEST AN INVOICE AT TIME OF CHECKOUT. SALES AND CUSTOMER SERVICE HOURS OF OPERATION ARE. IT'S LOCATED AT THE TOP RIGHT HAND SIDE OF THIS PAGE. TECH SUPPORT IS USUALLY NOT AVAILABLE UNTIL AROUND. If you are in a 3 day zone, and your package leaves on a Thursday, you will not receive it until Tuesday. If you have any questions, you may give a call at. This video is of our company race car owned and operated by Skip White. 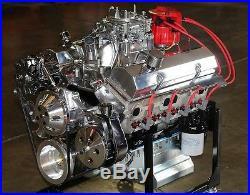 The item "SBC CHEVY TURN KEY ENGINE DRESS UP KIT, FRONT ACC. WP, ALT, PULLEYS, ETC" is in sale since Monday, January 12, 2015. 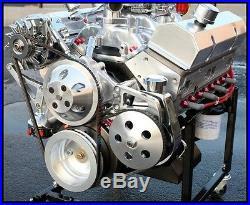 This item is in the category "eBay Motors\Parts & Accessories\Car & Truck Parts\Engines & Components\Other". The seller is "skipwhite" and is located in Kingsport, Tennessee. This item can be shipped worldwide.